Our Abpromise guarantee covers the use of ab25553 in the following tested applications. WB Use at an assay dependent dilution. Detects a band of approximately 95 kDa (predicted molecular weight: 85-110 kDa). 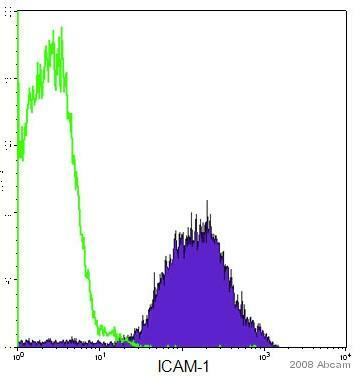 Flow cytometric analysis of C57BL/6 mouse splenocytes labelling ICAM1 with ab25553 at 0.1 μg/106 cells and labelling CD49b with a Rat Anti-Mouse CD49b-FITC antibody.